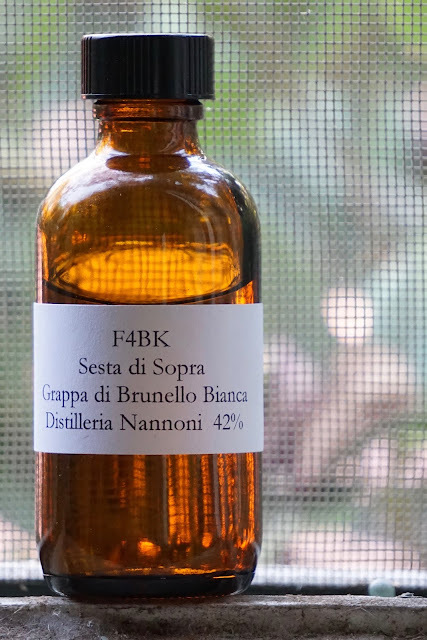 Sesta di Sopra Grappa di Brunello Bianca (42.0%): Still too hot to taste whisky for me. So, second grappa review in a row it is... The spirit in the sample bottle is distilled by Distilleria Nannoni as well but this time for Sesta di Sopra Estate and by using their pomace of Sangiovese di Montalcino. It is not aged and bottled at 42% abv. Color: Clear... With slow moving fat legs. Nose: White wine vinegar, goat milk and aged Manchego cheese. New make spirit, steamed green asparagus and artichoke. Very vegetal, grassy and creamy. Mushroom soup and heavy cream. Palate: New make... Mineral water, flavored sparkling water and dandelion leaves. Bitter greens and fresh cut grass. Dill yoghurt, vanilla and vegetable oil. Finish: Medium long and sweet. Skittles, sweetened lime juice and tarragon. Overall: Very gentle and easy drinking... Creamy and vegetal upfront and medium sweet at the finish. Again not one of those challenging Grappas but also not as sweet as Altesino. Perfect pairing with your after dinner espresso and a piece of lemon twist. For my two cents, the best way to enjoy a grappa. Yumm... Thanks to Florin again for the sample.